I’m one of those guys that loves the gym. I tend to go at least 3 to 5 times a week. More, if I can. I love to sweat and work the stress of the day away with the cardio machines, bikes, weights and/or swimming and ending it all up with a visit to the steam. I almost feel better just thinking about it. At my gym, like most gyms across the country and around the world, there are also those guys that are the “serious” weightlifters and body builders (of which I am not). These guys have their own fraternity of sorts. They talk the same language. They workout in the same area of the gym, they strike the same pose and drink the same body builder drinks. I like to think that I am strong and working hard to stay in some kind of decent shape and condition. These guys are Strong with a capital S and seem to be the epitome of physical strength. They’ve learned how to eat properly and know what weights and exercises to do to help them with their muscular development and conditioning. As I watch the body builders work out, even striking up a conversation when my workout bleeds over a little too close to their sanctuary, I marvel at their physical strength and my lack there of. As I look around the gym and all the hundreds, even thousands of people that run through there on a daily and weekly basis, I wonder about the strength of their hearts. Not necessarily their “physical” heart but their “spiritual” heart. Are they... are we God strong? 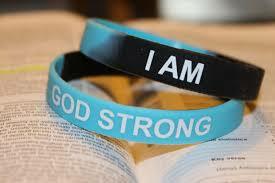 Sure we all tend to do a lot of physical things to make us strong and fit, but are we strong and fit with God? Do we daily put on the Full Armor of God? Are we daily doing the things that we need to do to strengthen our walk and fight the good fight? Do we love the Lord with all our heart, soul, mind and strength... and our neighbor as our self? Are we power lifting the Bible or are we still working the 2 lb. dumbbells? Do we do the hard work on the life changing prayer cardio machine? Are we eating the lean meat and drinking the water of the Living Word or are we still drinking milk? Are we stretching ourselves through faith-driven service and faith-trusting following? Are we running the race and in the fight... or are we driving by the parking lot amazed at the number of cars in the lot. It’s time to consult the Great Physician… and get started.